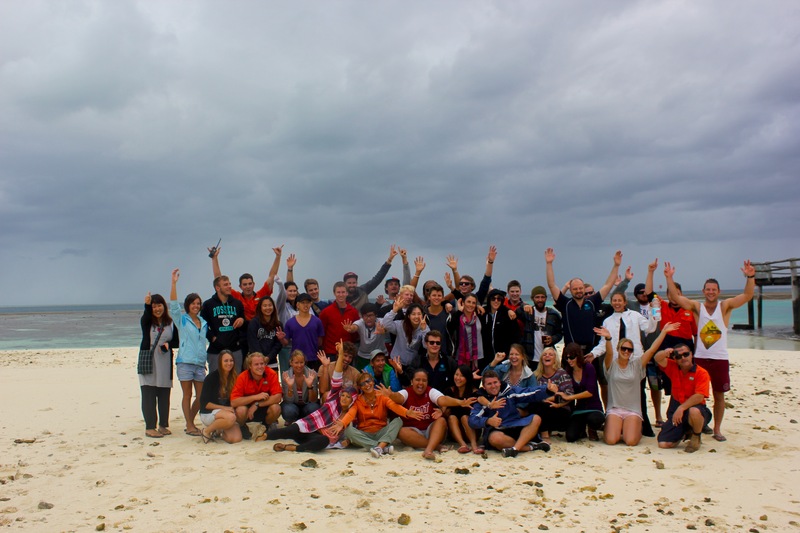 It's the opportunity I had at the beginning of year as I had the chance to live and work for almost four months on a tiny island located in the tropic of Capricorn, where starts the Great Barrier Reef. 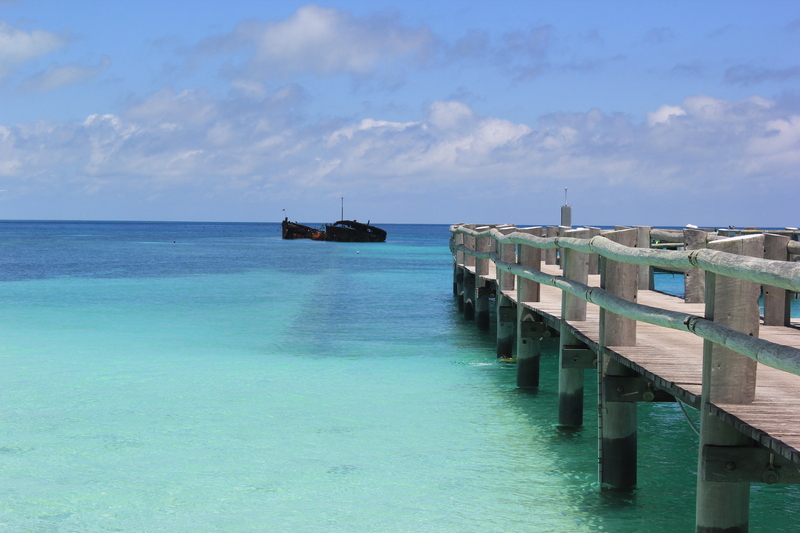 As soon as I left the canyon I was already on a new adventure two hours away from Gladstone, on Heron Island. A great opportunity for me to experiment a new environment and another type of isolation, the island measuring no more than 800 metres long and 300 metres large! I worked for the resort on the island as a waiter for one and a half months then as housekeeper for two months. 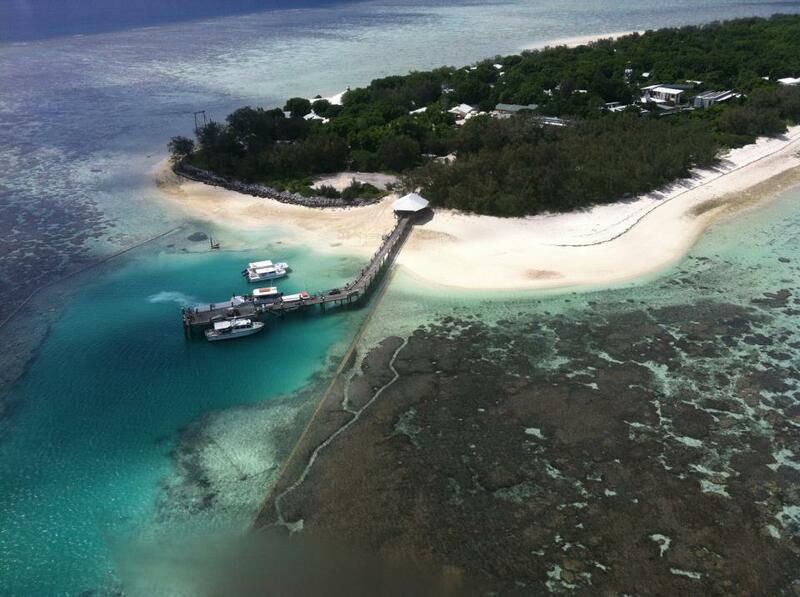 Once again work wasn't my main motivation to go to Heron Island – hospitality is definitely not my cup of tea! - I was much more attracted to the beauty of the place which is inhabited by an extraordinary aquatic life. Even though this island seems to be much more remote than Kings Canyon, isolation was much easier to live there than in the desert. The presence of water and beaches always near offers a range of activities such as diving, snorkling or just swimming and sunbathing! Even if we were working on the island, the holiday feel was always there and I never got tired of it! Also living so close to the sea has a very calming effect. The beaches often are desert or relatively quiet, they offer a perfect place to escape from the island life. Employees live together like in the resort in Kings Canyon. We get close to each other very quickly forming a real microcosm. Our thoughts become focused on the island life and we almost forget the outside world, a bit like if we were living in a bubble beyond time and space where nothing can reach us. A world without phone, without transport, without pollution...away from civilisation, away from everything. In the evenings we all get together either at the bar or at the jetty to watch the sun setting on the sea. 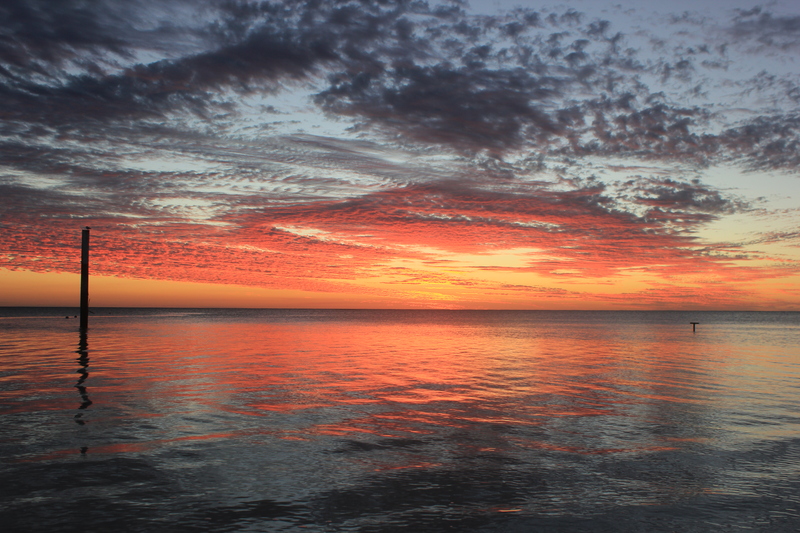 I've seen the most beautiful sunsets on Heron Island. It's like if clouds were catching fire and their reflection gives the calm water incredible colours, almost surrealist. 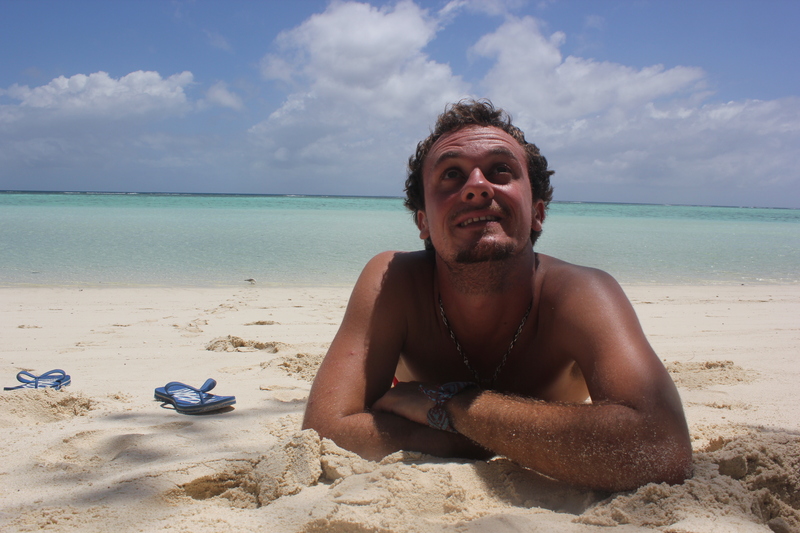 Heron Island was also one of the Jacques Cousteau's favorite diving spot, this is not very surprising regarding the richness and the beauty of the seabed around the island. The aquatic life is very accessible with many sharks, colourful fish, rays and turtles. I've never seen so many aquatic animals! 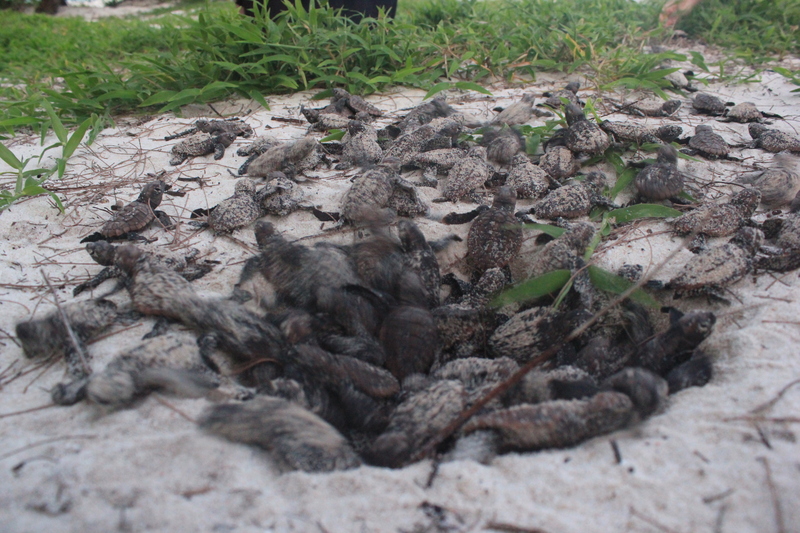 The most beautiful thing I have seen was turtle hatchlings one evening after sunset. Hundreds of them came out from the sand! The sight of these little creatures coming to life is the most extraordinary thing I have ever witnessed but also the saddest as these tiny turtles really fight to make their way to the sea where starving seagulls are waiting for them in lines to eat them! Out of a thousand turtles only one makes it because even if they survive the seagulls, other predators will be waiting for them in the water! But aquatic animals aren't the only inhabitants on the island, we can find many birds as well. What I found the most striking when I first arrived on the island – on top of the humidity due to the tropical climate – was the permanent noise which became louder and louder as I got inside the island which is full of vegetation...and birds! About 70 000 birds live on Heron island therefore we have to get used to the noise... and the birds excrement, both impossible to escape!!!! Some people just can't deal with it and have to leave the island only after a few days! I remember on my first evening as I was unpacking my bag I heard some screams which sounded exactly like baby cries. These screams became louder and louder and It felt like my room was suddenly surrounded by screaming babies crying all together. Later I realised that it wasnt babies – thanks god! - but mutton birds, a bird that comes out when it's getting dark and who is well known for its very particular screams! Finally the most difficult moment for me was to leave this island where I stayed between January 22nd til May 7th without ever getting out.We had to leave all together because the island was closing for three weeks of renovation. About 40 of us leaved at the same time. A last group picture on the beach and off we went, on the boat bringing us back to the main land. I remember the time when I saw the island appearing on the horizon for the first time at the end of January. I couldn't believe that it was already time for me to leave this place. The boat was moving away. We were waving at those who stayed. I was sad and I had so many memories in mind as I was watching the island becoming a tiny dot on the horizon before disappearing forever. As your body adjusts to the medicine throughout treatment these [url=http://genericlisinopril.party/]bonuses[/url] negative effects may vanish. Utilizing completely dry hands, get rid of the tablet and also place it [url=http://indocin.ru/]read full report[/url] in your mouth. Talk with your doctor about [url=http://wherecanibuyxenicaloverthecounter.nu/]xenical[/url] your particular danger of establishing belly cancer cells. Erythromycin is an effective macrolide antibiotic used for treating [url=http://ventolininhalernoprescription.nu/]ventolin inhaler no prescription[/url] acute pelvic inflamed illness, intestinal ameba infections, rheumatic temperature, chlamydia, skin infections, syphilis, eye infections, diphtheria, Legionnaires&#39; condition, breathing system infections or listeriosis. It&#39;s essential to discuss to [url=http://albuterolwithoutprescription.party/]albuterol[/url] your health treatment carrier any drugs you are presently taking that might interact with Acomplia, or any facets of your health and wellness disorder that could affect the treatment. There might be various other ones that can likewise communicate with Cafergot, and you will have to keep that in mind [url=http://indocin.webcam/]indomethacin 25 mg[/url] whenever prior to you begin a new therapy or right before using Cafergot. Zidovudine: HIVвЂ‘1 isolates with [url=http://genericprednisone.webcam/]prednisone[/url] lowered sensitivity to zidovudine have been chosen in cell culture and also were additionally recovered from topics treated with zidovudine. This drug is [url=http://metformin.space/]metformin[/url] normally taken when a day before morning meal. You might likewise take it regarding some meals if you are stressed regarding getting an indigestion. Do not share regarding various other individuals to whom it was not recommended. You [url=http://prednisoloneonline.webcam/]our site[/url] could take Cialis regarding some meals or without, however make certain you comply with all the suggestions your medical company provided. Our contrast page features best drug stores available, and you will certainly soon find the one you are searching for, without making any effort [url=http://cheaplevitra.science/]cheap levitra[/url] whatsoever&#33; Note: This page contains side results data for [url=http://propranololorderonline.nu/]propranolol order online[/url] the generic drug capecitabine.